Baked Ziti - the true pasta lovers ziti. Baked Ziti is a favorite among young children and seniors. This pasta can easily be handled by young children. It is easy for them to chew and swallow. It is versitle in that it goes great as a side dish or as a main course or meal. And, you can use it with just about any tomato sauce such as meat, vegetable or marinara. It is especially tasty when the ziti is simmered in the sauce for a good 5 to 10 minutes. 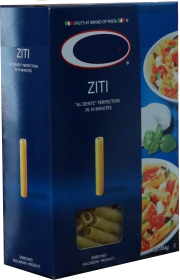 As you can see, we are using a brand of Ziti everyone knows, but regardless, the brand, use what you like and enjoy. Cook macaroni to aldente, drain and set aside in colander. This particular brand suggests a large pot of water 4 to 6 quarts with a little salt that is brought to a boil. The pasta is boiled for 10 minutes stirring occasionally so that it becomes aldente. Should you like your Ziti a bit softer, boil for an additional minute. Once cooked, drain well. With olive oil in the water the pasta will not stick. In a large bowl combine ricotta cheese, eggs, parsley, salt and pepper. In a medium size round casserole dish, cover bottom of dish with tomato sauce. Layer approximately 3 inches of ziti, then top with ricotta cheese mixture. Add additional layer of ziti, add sauce, add remainder of ricotta cheese mixture. Finish with remainder of ziti and add additional sauce. Top the casserole with shredded mozzarella cheese. Bake in a 350 degree oven for 30 to 40 minutes uncovered until sauce bubbles to top. Add a bit of Olive Oil to the water so the Ziti does not stick. Put remainder in reheat-able containers and bring for lunch. Should you have too much Ziti and have children, sometimes they just like to have the noodle with a bit of butter and some Parmesan cheese. If this is the situation, put the Ziti in a separate seal-able container and save for those quick "I'm Hungry" scenarios where the kids are hungry and dinner is a few hours away. See how baked ziti goes with these other Italian meals. Add this to your meal and take your dinner to the next level.